Chile has it all: gorgeous landscapes, smokin' hot babes, cool dudes and the wildest parties. For an American tourist, nicknamed Gringo (Eli Roth) by his two Chilean pals Ariel (Ariel Levy) and Pollo (Nicolás Martínez), the trip has been heaven on earth - except that he just can't hook up with the ladies. Gringo's luck seems to change when the group meets a trio of babes: Russian model Irina (Natasha Yarovenko), non-stop party girl Kylie (Lorenza Izzo) and her serious sister Monica (Andrea Osvárt). A night at the hottest local dance club turns into a night of terror and panic when a violent earthquake brings down paradise. Our unlucky heroes must run for their lives from looters, escaped convicts, and the inevitable aftershocks. For a twist on the disaster film genre, we head to 2013’s Aftershock. Set in Chile, American tourist “Gringo” (Eli Roth) hangs out with locals Ariel (Ariel Levy) and Pollo (Nicolas Martinez) as they tour wineries (Gringo’s idea) and go to clubs (Ariel’s idea). Along the way, the guys meet up with Russian model Irina (Natasha Yarovenko), her reckless friend Kylie (Lorenza Izzo) and Kylie’s serious-minded half-sister Monica (Andrea Osvart). They see the sights together and eventually experience a major earthquake. From there we follow their attempts to stay alive and deal with a mix of complications. When I referred to Aftershock as a twist on its genre, that comes from its somewhat unusual emphasis. Rather than offer a pure disaster flick, it really provides more of a horror tale. Sure, it sets up its drama via a natural disaster, but once that occurs, the story follows more of a horror vibe as we see the characters picked off one by one – and in a variety of gruesome ways. In the double-edged sword category, Aftershock provides way more character exposition than one would expect from an 89-minute combination horror/disaster flick. This means we spend a surprising amount of time with the six leads before the earthquake hits. On the surface, that’s a good thing, as it should create more interest in the participants and make us care more about their fates. It also creates a potential jolt when the earthquake finally hits; we’re lulled into a sense of calm before the storm, so the disaster theoretically comes with a bigger impact. “Theoretically” is the operative term there; in reality, the long period of exposition backfires. Actually, it’d work fine for viewers without any foreknowledge of the tale; if you enter blind, the earthquake will come as a complete surprise. That’d probably be the most fun way to experience the film; otherwise, you’re left to wait for the inevitable destruction to occur. And wait. And wait. And wait some more. I sort of feel bad for my criticism of the film’s extended exposition, as it seems like a trend I should praise. After all, so many movies of this sort zip through character areas with so little effort that I should applaud the decision to devote so much time to backstory. I think the problem comes from the lack of positive returns from all the time the film invests in the participants. If Aftershock used that cinematic real estate to really involve us in the roles, I’d be happy with it, but as it stands, it feels like wasted time. After many minutes with the characters, they remain simplistic and undeveloped; a five-minute synopsis would’ve been just as effective. Does the film pick up once the earthquake hits? Not really. It simply becomes wall-to-wall mayhem without much more than cynicism at its core. Again, I don’t want to reveal anything that might fall into spoiler territory, but I’ll say this: don’t expect a happy ending. The movie tries to be clever with the ways in which it takes care of its characters, but instead it just seems mean-spirited. Aftershock also looks and feels like the low-budget affair that it is. IMDB claims it came with a $2 million cost, and I guess it does fairly well for itself given that absence of funds, but I can’t say it rises above its cheapie origins. I couldn’t help but feel like I was watching something created to run on some basic cable network. I don’t want to come down too hard on Aftershock, as it’s not as bad as my comments may imply. For all its flaws, it comes with some interesting moments, and I appreciate its attempts to shake up two different genres. Unfortunately, it just doesn’t succeed in its efforts. Trivia note: if you think the girl Gringo chats up in a bar looks a lot like a certain pop star beloved by the tween set, that’s because it is her. Aftershock appears in an aspect ratio of approximately 1.78:1 on this Blu-Ray Disc. A low-budget vehicle shot on digital video, this was a good presentation but not one that looked great. For the most part, the film showed positive clarity. Some shots came across as a little soft – especially during wides – but those weren’t a prominent distraction, as the majority of the flick offered nice definition. I saw no signs of moiré effects or jaggies, and edge haloes failed to appear. Print flaws also didn’t present themselves. In terms of palette, Aftershock varied quite a bit dependent on setting and situation. Early “tourist” scenes went with a pretty natural feel, while nightclub shots emphasized neon tones to match the clubs. 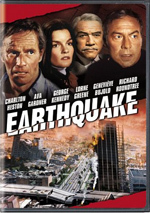 After the earthquake hit, the film tended more toward a teal impression. The hues looked fine; they didn’t dazzle, but they showed reasonable clarity. Blacks were fairly dark, and shadows showed nice delineation. This was a more than competent “B” image. As for the film’s DTS-HD MA 5.1 soundtrack, it offered an active affair that lost points due to a bit of a “bargain basement” feel. The mix did make good use of the five speakers, as various elements cropped up in logical places. However, they didn’t mesh all that well; they gave us a lot of material but didn’t quite plop us in the different situations as cleanly as I’d like. Audio quality was fine. Speech sounded concise and natural, while effects showed good clarity and accuracy, with nice low-end when necessary. Music seemed a little cheesy due to the use of synthesizers, but the track reproduced the original work well enough. Like the image, I thought the audio deserved a “B”. As we move to the disc’s extras, we locate a running, screen-specific audio commentary from writer/director Nicolas Lopez and writer/producer Eli Roth. (Actor Lorenza Izzo pops up briefly via cell phone as well.) They look at story/character issues, cast and performances, sets and shooting in Chile, stunts and various effects, costume/production design, issues related to the low budget, and other topics. Lopez and Roth combine for a fun and informative commentary. They joke with each other to make this a light, breezy piece, but they do more than just kid around, as they also ensure we learn a fair amount about the production. The track moves quickly and gives us a nice take on the film. 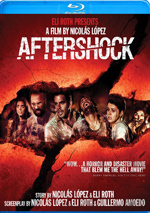 The Making of Aftershock runs nine minutes, 28 seconds and offers notes from Lopez, Roth, and actors Ariel Levy, Andrea Osvart, and Lorenza Izzo. We learn about the project’s origins and development, cast and performances, and various effects. “Making” gives us some decent shots from the set but remains a pretty insubstantial piece. Finally, Shaking Up the Casting Process lasts two minutes, 11 seconds and shows a prank the filmmakers pulled on aspiring actors. While these folks put on wetsuits, the changing booths simulate earthquakes and we see the actors respond. This is pretty lame Candid Camera territory, but we see a couple of hot actresses in their underwear, so it’s not a total loss. The disc opens with ads for Solomon Kane, Pusher, and Only God Forgives. No trailer for Aftershock shows up here. I hoped that Aftershock would provide an entertaining update on the disaster genre, but instead, I found a fairly blah mix of horror and thrills. While it’s sporadically entertaining, it never really coalesces. The Blu-ray offers generally good picture and audio as well as bonus features highlighted by a fun commentary. This isn’t a bad film, but it’s a forgettable one.